That's what happens when you live with a non-tomato lover! This is oh-so-perfect! We love tomatoes and can't live without them. This pie looks heavenly and very refreshing to look. We're new to your site and we're bookmarking this now. Nice to meet ya! Believe me, it tastes even better than it looks! That says a lot because it looks absolutely gorgeous! Yeah, I think I'll make it again, even if I do have to eat it all myself. 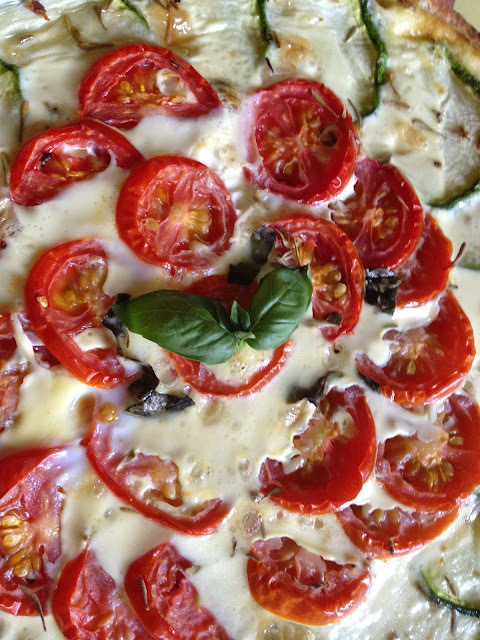 Using a Mandoline is quick and easy and gives you perfect circles or julienne slices all the same size. I'll have to make this. I made a tomato pie that turned out awful, wouldn't even post it. Maybe I needed to add zucchinis. I think I want a mandoline, Vicki. I only say "think" because I know how many knicks my hands get with a sharp knife. I'm not sure what a mandoline would do! Bill might eat a tomato pie, but he'd take one look at those zucchini and go running for the hills ;) But it looks incredible to me...I'd probably have to portion it out in the freezer, too, so I wouldn't eat the whole thing in one sitting! Actually, Mr. Rosemary doesn't care for zucchini either, but they're just a bit more easy to disguise. OMG girl! You finally made something I would eat that is called a tomato pie!!! I absolutely loathe anything with mayo in it! This is calling my name. Puff Pastry... oh my... a must must must try!!!!!!! !Totally the best recipe ever on the WEB~! 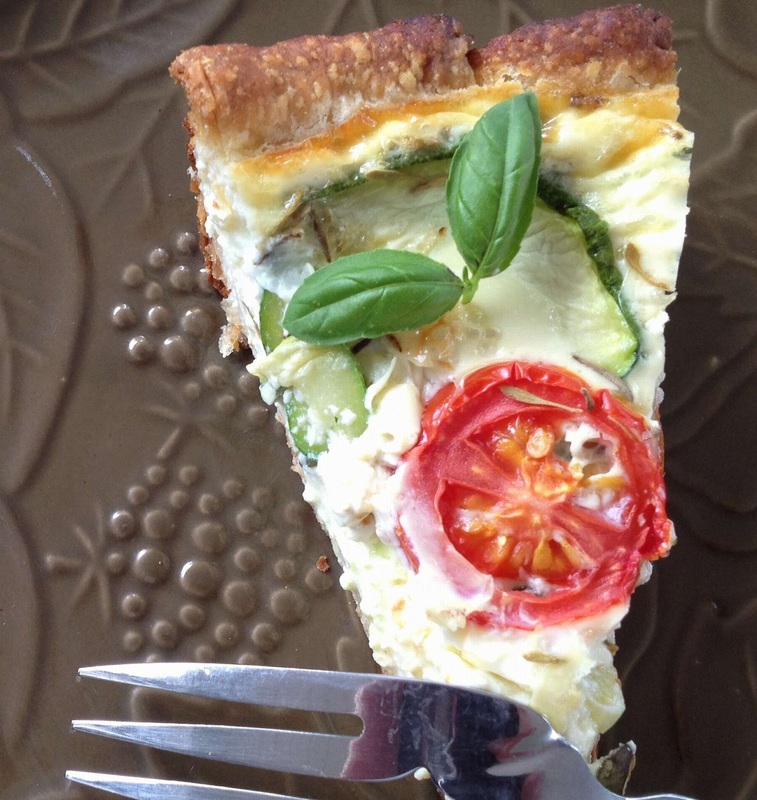 One word for this incredibly delicious tomato zucchini pie. GORGEOUS! I'll take you at your word, Elisabeth! You're right Rosemary, so many tomato pies to choose from! I love how you added zucchini, especially due to the same time that they are ready to harvest from the garden! And boy do I love the amount of cheese in this pie! YUM! Did I ever tell you I have "La Bella Vita" stenciled on my kitchen wall? Oh Rosemary! this is really beautiful!! I can just imagine how wonderful this tastes! As pretty to eat as to look at. Thanks, Jay. . . . hope you try it. This is absolutely beautiful! And it certainly looks delicious too. It was probably more of a cheese and egg pie than a tomato and zucchini pie, but I sure liked it! Now THIS is what I should be doing with all those garden zucchinis! Gorgeous! 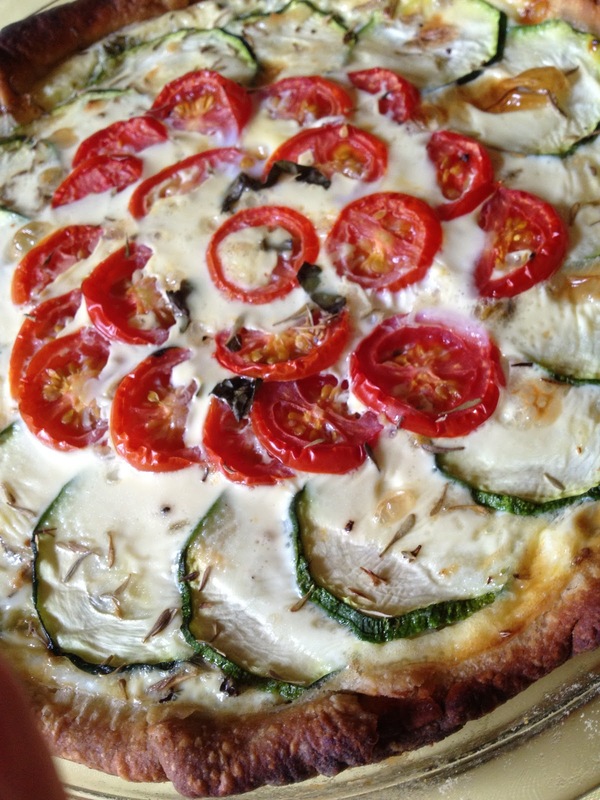 My zucchini are done, I'm afraid, but the tomatoes won't quit! Rosemary, this is a stunner and not a way to use up tomatoes but to celebrate them. I hate missing a post of yours, Claudia! I have a bottle of well chilled German Riesling, that I can bring it over for the dinner! The pie looks sensational! How did you know that a German Rielsing is my favorite? It wouldn't be summer without a tomato pie☺. I'm almost embarrassed to admit it was my first! I just bought zucchini and this looks like a great way to use it. I'm crazy about anything quichelike. BTW, I noticed your comment on Karen's post that you are visiting Rockport soon. I live there and would be happy to pass on any tips about the area if you would find them helpful. Thanks for the offer, Linda. (Your site, and your work -- just beautiful. )Thanks for the offer . . . I e-mailed you! Delicious. This pie looks beautiful and original to me! Thank you for sharing it with me. My Friday is already a bit better after visiting you. I hope you have a beautiful weekend! Quiche like stuff, I can handle. (Especially with purchased puff pastry!) Not like your pies, Monet! 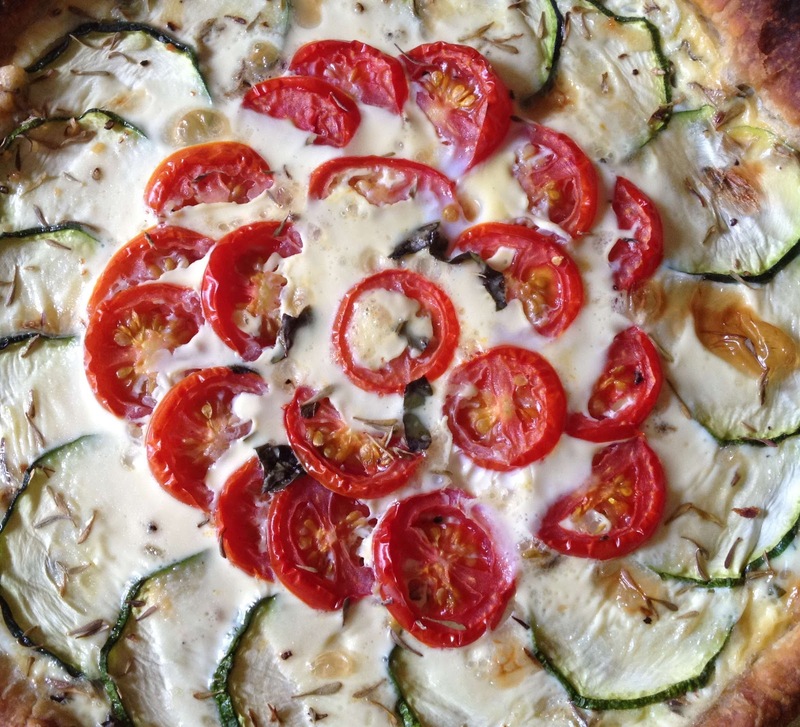 Oh this tomato pie looks good- I'm up to my eyeballs in tomatoes too! Yes, I kick myself when I complain about being lucky! We have tons of tomatoes here as well - always looking for new ways to use them up! It is a nice problem to have, agreed.